The Cruise Industry is a global citizen and with that comes a global responsibility. This responsibility is being taken seriously and there are big plans in motion. Until the major upgrades can be made, cruise lines are taking action with small steps which equal large changes for the environment. These changes include becoming plastic straw and stirrer free, plans to eliminate single-use plastics, even table-side butter will be in paper wrappers versus small plastic cups. “The difference in the wrapper is nil, but the environmental impact is significant in large volumes,” noted Bud Darr, executive vice president of maritime policy and government affairs at MSC. 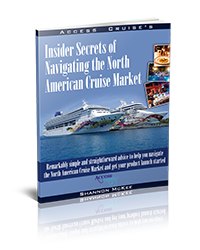 Future changes for the Cruise and Ferry Industry are big! 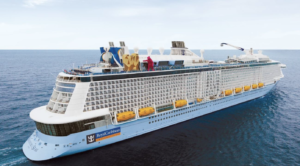 The main concept is to reduce the carbon footprint and energy consumption of cruise ships. To do this, researchers are developing a system based on fuel cells. One of the advantages of fuel cells is that they only produce CO2 and water, unlike a Diesel engine which also produces other pollutants, such as nitrogen oxides and particulate matter. As ideal as the fuel cells sound, they do have a downside; they cost ten times as much to produce as a traditional engine. The concept of supply and demand comes into play here; if there is a demand, the long term cost is only 20-30 percent higher than the cost of a traditional engine. And naturally, choosing a cleaner type of fuel is better for everyone. According to the Zero Emission Report, the long term ambition of the cruise industry is to have zero emissions for both water and air, not just at sea but also in port. Regulations for wastewater discharge were introduced in Alaska and the Baltic about 20 years ago, but that was just the start. This was followed by air emission restrictions for ports on the U.S. West Coast, and the next step is for new ships to be 20-30% more energy efficient than a 2015 ship. The goal is to reach this milestone by 2020 and 2025. Shipyards are full of newbuilds that are well on their way to meeting these targets. The plans show more energy efficient power plants, HVAC systems, lighting, galleys, hull forms and hull lubrication, and more. Additionally, energy management plans and more efficient operations are in the works. 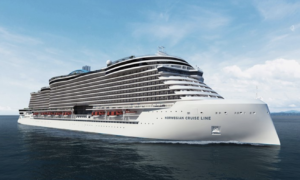 The ports and their local environmentalists have become more concerned about cruise ship emissions while in port, and that has created a real push for the Cruise Industry to become active in developing technologies and fuels to cut emissions at sea and in port. Currently, LNG is being explored as the “next” fuel, and there is work being done to advance fuel cell and energy storage technologies and fuels such as hydrogen, methanol and ammonia for ship applications, as well as solar and wind power. Some cruise lines with LNG ships on order are Carnival Corporation with the largest order book of green ships in the cruise industry. AIDA Cruises also has the new 183,900-ton AIDAnova which will be the first cruise ship in the world to be powered by LNG while both at sea and in port. MSC currently has the largest order book in the industry, and this includes five LNG-fueled ships. All of these ships will definitely be on the larger scale in order to hold larger tanks for the new fuels such as hydrogen, methanol and perhaps ammonia, NH3, which has no carbon content. These big changes and improvements will make the cruise industry more efficient but most importantly, more environmentally friendly to the earth and their host, the oceans!